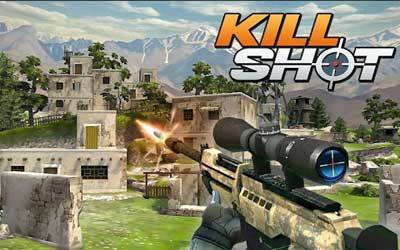 If you like to be elite force to eliminate enemy, then Kill Shot APK 3.3 will be your top choice. As shooting game, you will act as executioner to shoot enemy directly. When you succeed to hit enemy, it will get notification or show some effects. As executioner, this mission is secret and next one will be commissioned immediately. Shooting type game is always interesting to play, specifically in sniper mode. In this game, player sits on hidden ground then put mark through the riffle. There is instruction about mission before you go on stage. After completing mission, player get reward and it is very useful for upgrade. This game is not quick shooting mode because you will get more and more missions as replacement. It keeps player focus on shooting. Four maps will be presented as battleground. There is no significant change from one mission to others. You just hit to fulfill minimum quota. In this game, you act as ruthless killer with no mercy at all. Sniper relies on excellent weapon. For starter, you will get rifle with basic features. After you gain more reward, trade for more sophisticated weapon to make the precise shooting. Besides riffle, several weapons are presented to assist your task for eliminating enemy. As usual, some enemy backgrounds will appear to give realistic experience for player. You will know why this person is bad people and justify your shooting. It is not game for kid or casual play. You need time and focus to get successful mission. However, all of excitements in Kill Shot for android will be paid off with excellent graphic and attractive stories. Elite Ops Mode: Insanely hard missions in our later regions for our dedicated soldiers looking for new challenges. New Consumable Bundles available directly in store.